Using Manipulatives to Develop Mathematical Concepts: This series of pages is designed as a resource to teachers as they use manipulatives to help students develop meaning for mathematical concepts. As learners manipulate these hands-on "thinker toys," they reason mathematically in a very concrete approach to a concept. Next, students represent this thinking using pictures, words and numbers before moving to the abstract numbers-only stage. Differentiation: A mathematics teacher needs to develop the ability to effectively assess student understanding throughout instruction in order to intervene successfully to help all learners achieve daily objectives. Whether a student needs an extended timeline, a different approach, or a different manipulative (thinker toy) to explore a concept, effective teachers are always on the lookout for additional resources and strategies to add to their repertoire. These collections of activities help teachers locate appropriate manipulatives, as needed, to help individual students in their classes. For example, some students find that drawing antennas (or hairs) on coins to represent each 5 cents the coin is worth. [See picture at right.] The student then simply counts by 5s and then adds on the pennies. 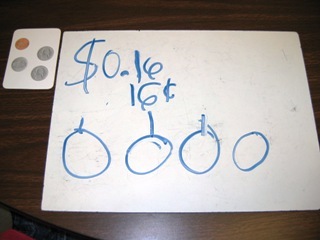 This method builds on student strength in counting by 5s and makes it unnecessary to rearrange coins in order to count. Student Choice: Teachers find that many different manipulatives may be used to introduce or extend a mathematical concept. Using several different manipulatives guarantees the likelihood that each student will find a concrete approach that works for him/her. Additionally, approaching a concept through different manipulatives helps to deepen student understanding. 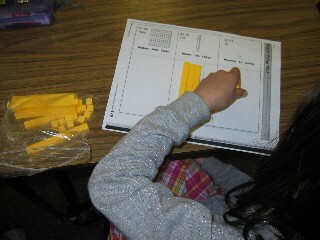 Math Center: Make manipulatives easily accessible in a math center. After the initial introduction, allow students to choose the manipulative that best helps him/her think through the problem sets. Encourage students to represent their manipulative work as a semi-concrete stage of thinking about a mathematical concept or problem. Students may use this approach at home or in other situations where the manipulatives are not readily available to them. See the Mathwire March 2008 issue to preview and download other Dr. Seuss math activities. Caroline Laurin-Young, a 2nd grade teacher from Oconto, WI, e-mailed to say she had used the Valentine activity this year called Valentine's Day Treat. Her students loved the challenge. 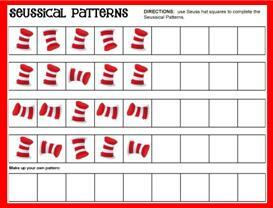 To make it a bit easier for her 2nd grade students, Caroline created a recording sheet so that they could better organize their solutions. She attached a copy with permission to distribute the handout on Mathwire. Thanks for sharing, Caroline! 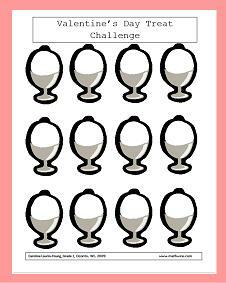 Download a copy of Caroline's Valentine's Day Treat Challenge Recording Sheet. Download a copy of the Mathwire problem Valentine's Day Treat which also includes a sample solution.